Good News! The Academic Staff Union of Nigerian Universities, ASUU, has officially called-off its 2017 strike action. ASUU will be suspending the strike till the end of October, 2017 for the Federal Government to fulfill their promise. The suspension of the strike was announced after a meeting with the government delegation Monday, 18th September, 2017. At the meeting, a memorandum of understanding was signed with the federal government delegation led by the Minister of Labour, Chris Ngige. Consequently, the leadership of the union has called on lecturers to resume duty as from tomorrow Tuesday 19th, 2017. The latest report reaching us is that the Pro-Chancellors has declare that all the Varsities to be open. does this means that the strike embarked by the Academic Staff Union of Universities (ASUU) has been called-off? Committee of Pro-chancellors of Nigerian Federal Universities, on Tuesday, unanimously ordered immediate re-opening of universities across the country. The communiqué signed by the Chairman of the Committee, Professor Kimse Okoko, was made available to newsmen late Tuesday in Abuja. The communiqué was issued at the end of the committee meeting to discuss the protracted strike by Academic Staff Union of Universities (ASUU) and other issues affecting the Nigerian university system. The communiqué stated that the decision to re-open the universities was unanimously agreed by all pro-chancellors in the overall interest of all concerned. The pro-chancellors, in the communique, directed all vice chancellors to comply with the committee decision. Nigerian Tribune gathered that the decision of the pro-chancellors was predicated on the earlier referendum held by various chapters of ASUU that voted 60-40 in favour of suspension of the over four months old strike. They expressed dismay that all efforts to resolve the crisis, including the intervention of President Goodluck Jonathan, has failed. 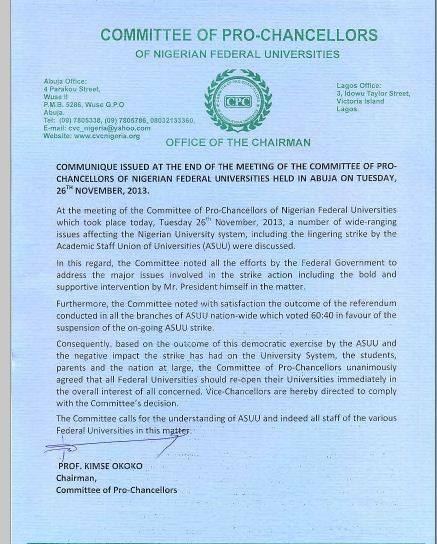 The pro-chancellors called for the understanding of ASUU and indeed all staff of the various universities in Nigeria. This order is coming on the heels of polarisation that has already crept into the ASUU, following the meeting they had with President Goodluck Jonathan penultimate week. Nigerians were amazed that the emergency National Executive Council meeting, held in Kaduna last weekend, came out with fresh conditions for suspension of strike after it was rumoured that a deal was struck with President Jonathan. ASUU has been on strike since July 1 and the NEC meeting was to deliberate on the resolutions of various chapters of ASUU on whether the strike should be suspended or not based on the offers by the government. Nigerian Tribune gathered that the pro-chancellors were aggrieved that even when majority of the members of ASUU want the strike called off, few elements in the union have refused to yield to the popular desire of the members. Meanwhile, the crisis rocking the University of Lagos (UNILAG) chapter of ASUU, over its continued participation in the ongoing strike action by the union’s national body, worsened on Tuesday as the two factions in the crisis openly traded insults. The congress, called on Monday, saw a sharp division in the chapter with a faction favouring a pull-out from the strike action, giving a week ultimatum to open the institution. The faction also promised undisclosed further actions if the ultimatum was not met, after it held a separate congress following the disruption of the earlier one. Please share this information with our friends on twitter and Facebook. Academic Staff Union of Universities (ASUU) Strike Has been Called Off!